Casey has doubts about whether he is capable of being a Power Ranger especially in light of how good Lily and Theo are. He therefore begs RJ to train him harder than ever before but is frustrated by the tasks he gets set that seem totally mundane. 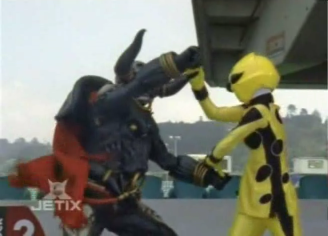 Meanwhile Dai Shi unleashes the Buffalord to defeat the Power Rangers. This whole episode is something of an homage to the Karate Kid film series which for older guys like me evokes that old feeling of nostalgia that seems to get more important with each passing year. From the pilot episode we knew Casey was not as well trained as Lily and Theo and I am glad they didn’t just use the TV magic trick of now he is a Power Ranger he is awesome. One advantage of being familiar with the Karate Kid movies is that when you see all the things RJ is making him do you try and figure out how they are going to be translated in to moves. The pay off of watching Casey work and then translate them in to moves was pretty good and very fluid. After the pilot episode I am glad we get to see what RJ is capable of. In the pilot he was just too much of a slacker and I couldn’t take him serious. Now we see he has some moves and so is worthy of being the “Zordon” of the show even if he is the most unlikely so far. Oh poor Camille. As you say, Dai Shi really isn’t interested in you. I can’t help but feel that Holly Shanahan is having to more or less recycle her character from Mystic Force in that she is a bit of a needy bimbo at times and that’s a shame. She is a strong character but her love for Dai Shi is a real weakness. I hate to sound all nanny-state but I do wonder if this is a poor message to young girls; if a boy doesn’t like you then you need to do all you can to make him like you. Maybe now I am a parent to a little girl I am looking in to it too much. Anyway, this episode was a lot of fun and I thoroughly enjoyed it. The pacing was good, the action was good and the comedy was actually funny.